SA-CME credits are available for this article here. While the gold standard for curative treatment of stage I non-small cell lung cancer (NSCLC) is lobectomy,1,2 year-over-year increased use of stereotactic body radiation therapy (SBRT), also known as stereotactic ablative radiation therapy (SABR), is growing exponentially.3 During multidisciplinary tumor board discussions regarding prospective management of stage I NSCLC patients, a knowledge gap is often realized. Relatively new techniques (over the last 10 years) of SBRT and interventional pulmonology (IP) have advanced rapidly into the mainstream practice and affect the time interval to treatment. These techniques involve a higher complexity, cost and number of experts required for success compared to standard conformal radiation therapy for NSCLC. This report attempts to provide, in brief fashion, key information that may foster a deeper understanding and appreciation for patient selection, workup, behind-the-scenes critical quality assurance tasks, and clinical pearls for stereotactic radiation therapy for lung cancer. SBRT is appropriate for patients with biopsy-proven T1/T2, N0M0 non-small cell carcinomas. Ideally, patients will be thoroughly evaluated with computed tomography (CT) and positron emission tomography (PET)-CT for staging, augmented by IP sampling of suspicious hilar/mediastinal nodes. Oxygen dependence and very poor pulmonary function tests (PFTs) need not contraindicate SBRT in and of themselves, as long as the patient meets criteria for performance status and life expectancy. We typically do not offer treatment for such patients who have required two or more hospitalizations for chronic obstructive pulmonary disease (COPD)-related issues in the past year. In treating such a patient, we often set tighter constraints on lung parenchymal dose (addressed below). SBRT is generally not appropriate for patients with transmural invasion into airways or the esophagus, even for small tumors; endoscopy may be required to rule it out when imaging is equivocal. For peripheral tumors (at least 2 cm from the central airways), published dosing guidelines include 30 to 34 Gy in a single fraction10,14 and 54 to 60 Gy in 3 fractions.7,9 We most frequently use the 3-fraction regimen. Recent phase II data show equivalent outcomes for the single-fraction regimen;10 in the absence of phase III data, we suggest limiting its use to T1 tumors and to squamous histology. For tumors extensively contacting the chest wall, we occasionally use 4- and 5-fraction regimens, using the chest wall dose constraint discussed below. Regarding normal tissue dose constraints, Quantitative Analyses of Normal Tissue Effects in the Clinic (QUANTEC)18 and American Association of Physicists in Medicine (AAPM) Task Group (TG) 10119 are good places to start and serve as the primary references for our physics staff. The relevant organs at risk (OARs) include normal lung parenchyma, esophagus, spinal cord, heart/left ventricle/coronary arteries, great vessels, trachea and major airways, brachial plexus, chest wall, and occasionally the stomach. In our opinion, many published dose constraints have two drawbacks: 1) They are based on lifetime organ tolerance doses, taking no account of possible future need for another course of thoracic radiation therapy. 2) They often prescribe point dose maxima, which in our opinion are not meaningful if appropriate volume-based constraints are met, and if taken too literally may preclude adequate coverage of a primary tumor adjacent to an OAR. For the normal lung parenchyma, we subtract the PTV volume and then require V12 Gy < 15%. If the 50% conformality index (volume of 50% prescription dose volume /PTV volume) is > 3, we typically also require V7 Gy < 20% and V20 Gy < 10%. Tighter constraints may be set when PFTs are very poor (forced expiratory volume in 1 second [FEV1] or diffusing capacity of the lungs for carbon monoxide [DLCO] < 30% predicted); V12 Gy < 10% to 12% is reasonable to try. For the spinal cord, we typically require that most of the cord receive < 8 Gy/12 Gy/15 Gy for 1-fraction, 3- or 4-fraction, and 5-fraction regimens, respectively. We then allow small volumes to receive more if needed to cover the PTV, up to and including 0.25 cc to 0.5 cc allowed to exceed the prescription dose. We typically write a series of 3 to 5 constraints with progressively smaller volumes allowed to receive more than various progressively increasing doses, effectively forcing the dose-volume histogram (DVH) into an acceptable form. The above values allow for reirradiation, should the need arise. We take a similar approach to the remaining listed OARs. The esophagus in particular is clearly a “series” organ and when treating a tumor abutting the esophagus, we endeavor to avoid circumferential high dose. We may contour separate volumes for the adjacent and opposite sides of the esophagus at the level of the tumor, and set a point maximum constraint on the opposite side volume while simultaneously applying a set of volume constraints on the adjacent side. This maneuver is aided by having the patient swallow dilute barium sulfate at the time of simulation. If there is difficulty meeting dose constraints, a few measures may be essayed. PTV margins may be reduced, either symmetrically or asymmetrically on the side adjacent to the problematic normal organ. Dose may be reduced; in our opinion a dose less than the equivalent of 8 Gy x 5 is probably not meaningful in the definitive setting. Fractionation may be increased with single- or 3-fraction regimens converted to 3, 4 or 5; the European SBRT literature is notable for 8-fraction regimens, which we have occasionally used. Finally, the relevant dose constraints may be judiciously relaxed. It is important to note that, in general, tumor doses are underestimated with use of more naïve dose calculation algorithms such as ray tracing.21 Due to the many tissue density interfaces inherent in treating lung and spinal cord lesions, we use a Monte Carlo dose calculation algorithm for these sites. For tumors > 5 cm, we treat according to the above guidelines if the relevant normal tissue constraints can be met. We do not consider these tumors appropriate for single-fraction treatment until further data is available. For tumors abutting the heart, we contour the myocardium and the left anterior descending artery (LAD) (or other adjacent major coronary vessel) and set a series of dose/volume constraints as described above. It is again important to note that, in many cases, a small volume (on the order of 0.5 to 1 cc) of the cardiac OARs must be allowed in the prescription dose volume to cover the tumor. Also, excellent, reliable motion compensation is needed to establish confidence regarding accurate dose delivery. Single-fraction treatment is not appropriate in this setting. For tumors abutting the chest wall, we typically use 4 or 5 fractions and set a constraint of V30 Gy = 30 cc or less.22 Patients should be counseled at consultation and at follow-up regarding the symptoms of postradiation myositis and risk of rib fracture, with the former relatively common (20% to 25% of patients with such tumors) and the latter relatively rare (< 2%) in our experience. The role of the interventional pulmonologist and advanced bronchoscopist has changed significantly in the past 10 years in lung cancer evaluation.23 The yield of tissue for diagnosis in peripheral nodules < 2 cm with traditional fiberoptic bronchoscopy is < 14% leaving little diagnostic role for the pulmonologist for many years.24 For this reason, computed tomography (CT)-guided biopsy had been the mainstay for peripheral lesions due to its high sensitivity of 90% in malignant disease,25 but came with the cost of pneumothorax in up to 20% to 40%.26 CT-guided biopsy also remains an incomplete procedure, not allowing simultaneous access to the mediastinum and hilum, or ability to provide advanced treatment planning with fiducial marker placement in one setting. Due to the complex nature of this evaluation, patients require multiple specialty visits for diagnosis, staging and planning prior to their first treatment, which can easily lead to fragmented care and long delays in treatment time. Recent advances in image-guided biopsies have changed the paradigm to allow streamlined evaluation for diagnosis, staging and treatment planning all in one procedure under the direction of an interventional pulmonologist or advanced bronchoscopist. The two most important modalities are endobronchial ultrasound (EBUS) and electromagnetic navigational bronchoscopy (ENB). Electromagnetic navigational bronchoscopy is a DICOM image-guided technique that uses a navigational system to guide instruments through the airways to target a lesion for biopsy. Thin-slice CT images (< 2 mm) in the planning phase create a virtual 3-dimensional (3D) tree of the airway to use as a roadmap. CT formatting is essential for accurate navigation and parameters differ per scanner. 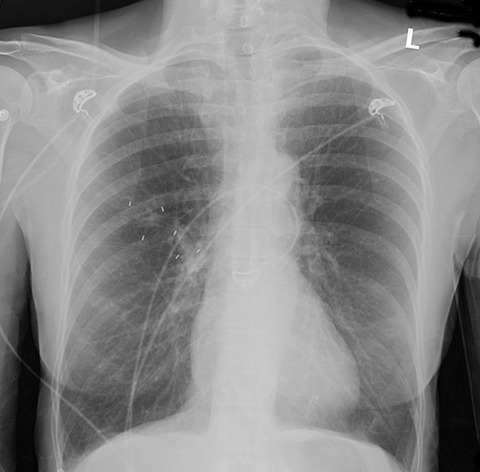 ENB uses an electromagnetic field board placed under the patient’s thorax to enable real-time tracking of instruments. Tissue sampling success with ENB alone varies widely but averages 65% per attempt, and improved rates of successful biopsies are seen in upper and middle lobe lesions, positive bronchus signs, and greater experience by the user to overcome the learning curve.32 Angulated 45- to 130-degree catheters can assist in entering hard-to-maneuver airways such as the superior segment of the lower lobe and apical medial portion of the upper lobe. Biopsy of lower lobe peripheral lesions can also be challenging due to respiratory motion and increasing atelectasis as procedure length expands. We strongly recommend review of anatomic restrictions with thoracic, surgical and pulmonary colleagues to understand where the highest chance of success for biopsy and fiducial placement exists. An added advantage with ENB is the ability to approximate distance from the center of the lesion to allow ideal fiducial placement per radiation oncology protocols. A novel approach using ENB is a fiducial marker placement guidance system (FPGS). The system leads to less migration of fiducials and a greater number of patients who had 6D motion tracking vs 3D.33 Further improvements may eventually decrease CTV to PTV margins. Selection of fiducial type and placement preferences may differ by radiation therapy delivery device and facility. Open conversation is encouraged between proceduralists and radiation oncologists to establish best practices based on resources, experience and equipment availability. We note increased success in multiple key metrics identified in a pilot in our hospital system in which streamlined patient intake for initial evaluation of possible stage I NSCLC is performed by the interventional pulmonologist/advanced bronchoscopist as their first point of contact. 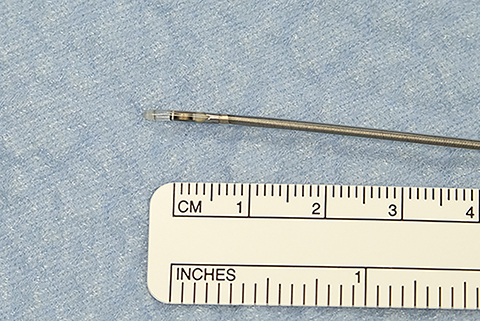 While this requires increased upfront work for the proceduralist, outcomes noted to date are more timely evaluation, a single-setting biopsy and fiducial placement in the majority of patients. (Figure 3). This includes a real-time multidisciplinary discussion of each patient, use of specialist nurse navigators, and lung nodule coordinators to assist patients with care coordination and improve patient retention. Quality control (QC) and quality assurance (QA): Implement and maintain both initial and ongoing periodic QA/QC for all aspects of the treatment simulation (CT/PET/magnetic resonance imaging [MRI]), treatment planning, and treatment delivery processes. Perform or supervise the treatment planning process with the radiation oncologist. Verify that the final approved treatment plan satisfies the radiation oncologist’s prescription. Implement comprehensive checklists for the entire treatment delivery process. Provide direct supervision for all treatment delivery sessions. Entire books are devoted to clinical medical physics as it relates to lung SBRT treatments. In the interest of brevity, our comments are restricted in scope to gantry-based linear accelerators and not robotic and tomotherapy linacs. Modern gantry-based linear accelerators have sufficient precision and redundancy to allow the use of stereotactic techniques broadly across community hospitals. Periodically, the physicist tests the precision and accuracy of all systems to ensure that they persist throughout the life of the program and are within acceptable tolerance for every SBRT treatment. A program needs adequate physics staffing, equipment, and a well-documented QA program. The AAPM has, in the form of TG 101 and 142,35,36 published extensive recommendations for the QA of those machines, and the systems built around enlisting them in an SBRT program. We direct the interested reader to those reports for further reading. Practically, the main objectives are to ensure the planned delivery satisfies the prescription, set the patient into position within the acceptable uncertainty, utilize imaging to fine-tune and confirm patient positioning prior to treatment, and monitor patient positioning during treatment to ensure successful delivery geometry. All aspects of the physicists’ key responsibilities reflect these treatment objectives. Several methods are commonly used for managing and monitoring patient motion during lung SBRT treatments. There is target motion, which is expected and planned for, and then there is unacceptable and unplanned motion of the target. Generally, the planned motion is due to respiratory motion during the portion of the respiratory cycle in which we want to treat the tumor. This can be, and most often is, the entire cycle. This motion is accounted for in the PTV using the information from the 4D-planning CT. This target volume plus the uncertainty of the treatment delivery system as a whole defines the final target volume (PTV). This PTV can usefully define the line dividing acceptable and unacceptable intrafraction patient motion. The most common ways to monitor that motion for lung SBRT are through either a surrogate or x-ray imaging. Two surrogates are commonly used: an infrared-visible cube reproducibly positioned on the patient’s body, or a system that monitors a region of interest of the patients’ skin surface itself. The main assumption with these systems is that tumor and general patient motion are well represented by the motion of the body surface. Alternatively, it is common to use periodic x-ray imaging of fiducial markers placed in proximity to the target to guide initial patient setup and monitor intrafraction motion. The literature contains extensive comparisons of fiducial markers and relative merits. For patient positioning alone, an ideal marker would be as small as is consistent with reliable low-dose x-ray imaging, artifact free when acquiring cone-beam CTs (CBCTs) for initial positioning, low cost, and free from tendencies to migrate between planning CT and treatment delivery. Fiducial markers tend to excel with some, but not all, of these characteristics. It is important to work as a multidisciplinary team (consisting of pulmonology, radiation oncology, and medical physics experts, etc.) when evaluating which marker(s) to incorporate into the lung SBRT program. In summary, the highest-quality physics programs supporting lung SBRT share a set of characteristics: a) adequate physics and dosimetry staffing in line with industry recommendations (ASTRO, ACR are relevant examples); b) thorough documentation of the QA program and results; c) adequate equipment to support the QA program; d) a lung SBRT-specific patient positioning system; e) a system to monitor patient motion during SBRT treatments; and f) most importantly, team-based collaboration between all disciplines involved in the safe implementation of SBRT to periodically review all aspects of the program to ensure it evolves as these techniques advance. Delivery of a few high-dose fractions to a small target carries with it one of the highest risk/reward scenarios in clinical radiation oncology. 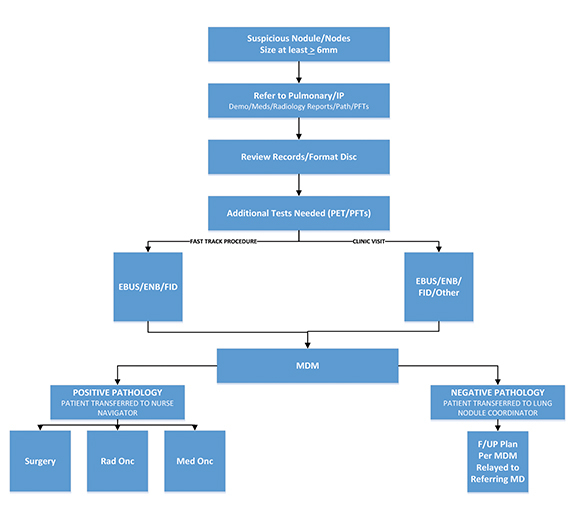 Although it does take longer for a patient to start treatment compared to nonstereotactic radiation therapy for lung cancer, it is helpful for the multidisciplinary team to understand this in context of the unique circumstances of fiducial placement, SBRT plan complexity, risks, adaptive constraints, and “behind-the-scenes” critical quality assurance tasks, to deliver safe, effective, best practice ablative radiation therapy. Ettinger DS, Wood DE, Aisner DL, et al. Non-small cell lung cancer, version 5.2017, NCCN Clinical Practice Guidelines in Oncology. J Natl Compr Canc Netw. 2017;15(4):504-535. Ginsberg RJ, Rubinstein LV. Randomized trial of lobectomy versus limited resection for T1 N0 non-small cell lung cancer. Lung Cancer Study Group. Ann Thorac Surg. 1995;60(3):615-22; discussion 22-23. Holmes JA, Zagar TM, Chen RC. Adoption of stereotactic body radiotherapy for stage ia non-small cell lung cancer across the United States. JNCI Cancer Spectrum 2017;1(1):1-6. Schneider BJ, Daly ME, et al. Stereotactic body radiotherapy for early-stage non-small-cell lung cancer: American Society of Clinical Oncology endorsement of the American Society for Radiation Oncology evidence-based guideline. J Clin Oncol. 2017:JCO2017749671. Videtic GM, Donington J, Giuliani M, et al. Stereotactic body radiation therapy for early-stage non-small cell lung cancer: executive summary of an ASTRO evidence-based guideline. Pract Radiat Oncol. 2017;7(5):295-301. Guckenberger M, Andratschke N, Dieckmann K, et al. ESTRO ACROP consensus guideline on implementation and practice of stereotactic body radiotherapy for peripherally located early stage non-small cell lung cancer. Radiother Oncol. 2017;124(1):11-17. Baumann P, Nyman J, Hoyer M, et al. Outcome in a prospective phase II trial of medically inoperable stage I non-small-cell lung cancer patients treated with stereotactic body radiotherapy. J Clin Oncol. 2009;27(20):3290-3296. ACR-ASTRO practice parameter for the performance of stereotactic radiosurgery, amended 2014. https://www.acr.org/-/media/ACR/Files/Practice-Parameters/SBRT-RO.pdf. Accessed January 28, 2018. Videtic GM, Hu C, Singh AK, et al. A Randomized phase 2 study comparing 2 stereotactic body radiation therapy schedules for medically inoperable patients with stage 1 peripheral non-small cell lung cancer: NRG Oncology RTOG 0915 (NCCTG N0927). Int J Radiat Oncol Biol Phys. 2015;93(4):757-764. Grills IS, Mangona VS, Welsh R, et al. Outcomes after stereotactic lung radiotherapy or wedge resection for stage I non-small-cell lung cancer. J Clin Oncol. 2010;28(6):928-935. Rutter CE, Corso CD, Park HS, et al. Increase in the use of lung stereotactic body radiotherapy without a preceding biopsy in the United States. Lung Cancer. 2014;85(3):390-394. Binkley MS, Hiniker SM, Chaudhuri A, et al. Dosimetric factors and toxicity in highly conformal thoracic reirradiation. Int J Radiat Oncol Biol Phys. 2016;94(4):808-815. Videtic GM, Stephans KL, Woody NM, et al. 30 Gy or 34 Gy? Comparing 2 single-fraction SBRT dose schedules for stage I medically inoperable non-small cell lung cancer. Int J Radiat Oncol Biol Phys. 2014;90(1):203-208. Bezjak A, Paulus R, Gaspar LE, et al. Primary study endpoint analysis for NRG Oncology/RTOG 0813 Trial of Stereotactic Body Radiation Therapy (SBRT) for Centrally Located Non-Small Cell Lung Cancer (NSCLC). Int J Radiat Oncol Biol Phys. 2016;94(1):5-6. Mangona VS, Aneese AM, Marina O, et al. Toxicity after central versus peripheral lung stereotactic body radiation therapy: a propensity score matched-pair analysis. Int J Radiat Oncol Biol Phys. 2015;91(1):124-132. Park HS, Harder EM, Mancini BR, Decker RH. Central versus peripheral tumor location: influence on survival, local control, and toxicity following stereotactic body radiotherapy for primary non-small-cell lung cancer. J Thorac Oncol. 2015;10(5):832-837. Marks LB, Bentzen SM, Deasy JO, et al. Radiation dose-volume effects in the lung. Int J Radiat Oncol Biol Phys. 2010;76(3Suppl):S70-S6. Benedict SH, Yenice KM, Followill D, et al. Stereotactic body radiation therapy: the report of AAPM Task Group 101. Med Phys. 2010;37(8):4078-101. Grills IS, Fitch DL, Goldstein NS, et al. Clinicopathologic analysis of microscopic extension in lung adenocarcinoma: defining clinical target volume for radiotherapy. Int J Radiat Oncol Biol Phys. 2007;69(2):334-341. Bibault JE, Mirabel X, Lacornerie T, et al. Adapted prescription dose for Monte Carlo algorithm in lung SBRT: Clinical outcome on 205 patients. PLoS One. 2015;10(7):e0133617. Mutter RW, Liu F, Abreu A, et al. Dose-volume parameters predict for the development of chest wall pain after stereotactic body radiation for lung cancer. Int J Radiat Oncol Biol Phys. 2012;82(5):1783-1790. Silvestri GA, Gonzalez AV, Jantz MA, et al. Methods for staging non-small cell lung cancer: diagnosis and management of lung cancer, 3rd ed: American College of Chest Physicians evidence-based clinical practice guidelines. Chest. 2013;143(5 Suppl):e211S-e50S. Baaklini WA, Reinoso MA, Gorin AB, et al. Diagnostic yield of fiberoptic bronchoscopy in evaluating solitary pulmonary nodules. Chest. 2000;117(4):1049-1054. Rivera MP, Mehta AC, Wahidi MM. Establishing the diagnosis of lung cancer: diagnosis and management of lung cancer, 3rd ed: American College of Chest Physicians evidence-based clinical practice guidelines. Chest. 2013;143(5 Suppl):e142S-e65S. Cox JE, Chiles C, McManus CM, et al. Transthoracic needle aspiration biopsy: variables that affect risk of pneumothorax. Radiology. 1999;212(1):165-168. Hammoud ZT, Anderson RC, Meyers BF, et al. The current role of mediastinoscopy in the evaluation of thoracic disease. J Thorac Cardiovasc Surg. 1999;118(5):894-899. Lemaire A, Nikolic I, Petersen T, et al. Nine-year single center experience with cervical mediastinoscopy: complications and false negative rate. Ann Thorac Surg. 2006;82(4):1185-9;discussion 9-90. Chen A, Chenna P, Loiselle A, et al. Radial probe endobronchial ultrasound for peripheral pulmonary lesions. A 5-year institutional experience. Ann Am Thorac Soc. 2014;11(4):578-582. Han Y, Kim HJ, Kong KA, et al. Diagnosis of small pulmonary lesions by transbronchial lung biopsy with radial endobronchial ultrasound and virtual bronchoscopic navigation versus CT-guided transthoracic needle biopsy: A systematic review and meta-analysis. PLoS One. 2018;13(1):e0191590. Steinfort DP, Khor YH, Manser RL, Irving LB. Radial probe endobronchial ultrasound for the diagnosis of peripheral lung cancer: systematic review and meta-analysis. Eur Respir J. 2011;37(4):902-910. Gex G, Pralong JA, Combescure C, et al. Diagnostic yield and safety of electromagnetic navigation bronchoscopy for lung nodules: a systematic review and meta-analysis. Respiration. 2014;87(2):165-176. Stowe HB, Ogake S, Sunil S, et al. 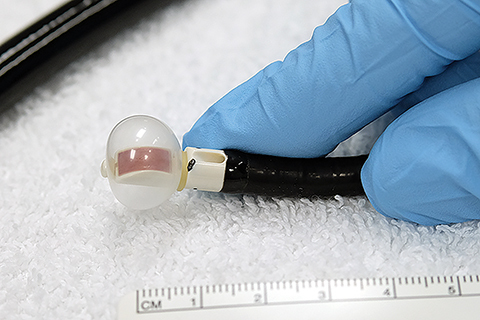 Improved respiratory motion tracking through a novel fiducial marker placement guidance system during electromagnetic navigational bronchoscopy. Int J Radiat Oncol Biol Phys. 2017;99(2S):E675-676. Halvorsen PH, Cirino E, Das IJ, et al. AAPM-RSS Medical Physics Practice Guideline 9.a. for SRS-SBRT. J Appl Clin Med Phys. 2017;18(5):10-21. AAPM Report No. 142 - Task Group 142 report: Quality assurance of medical accelerators. Med Phys. 2009;36:4197-4212. AAPM Report No. 101 – Stereotactic body radiation therapy: the report of AAPM Task Group 101. Med Phys. 2010;37:4078-4101. Kennedy A, Garwood S, Grow A, Lipscomb R. Stereotactic body radiation therapy in early stage non-small cell lung cancer: A brief primer for the multidisciplinary tumor bo. Appl Rad Oncol. 2018;7(1):9-15. Dr. Kennedy is physician-in-chief, Radiation Oncology, Sarah Cannon, Nashville, TN. Dr. Garwood is physician leader, Pulmonology, Sarah Cannon. Dr. Grow is physician leader, Radiation Oncology, Sarah Cannon; and North Florida Radiation Oncology, Gainesville, FL. Mr. Lipscomb is medical physics leader, Sarah Cannon. Disclosure: Dr. Garwood is a consultant to Medtronic, Minneapolis, MN. The remaining authors have no conflicts of interest to disclose. None of the authors received outside funding for the production of this original manuscript and no part of this article has been previously published elsewhere.